Almost as much fun as watching the matches is checking out the US Open tennis fashion. This year continues a trend towards variety of colors — not only in women’s clothes, but also in their shoes. Here are some ladies tennis fashions I’ve noticed so far during the tournament. Tennis diva Maria Sharapova is looking glam as usual. Nike has furnished her with a daytime tunic as well as an evening dress. Serena always stands out: not only for her dominant play, but also for her short skirts that emphasize the size and strength of her quads, hamstrings and glutes. This year she’s wearing an animal print dress. 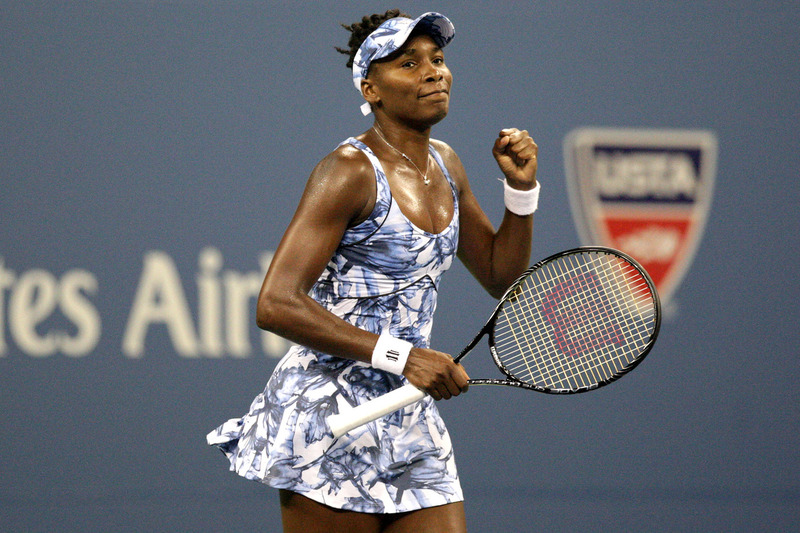 For her first round (evening) match, her dress was a more “formal” black and white — a snow leopard pattern. But then for her day match vs. Vania King, she sported the same print in pink and red. Serena by day: spotted pink panther? Tennis fashion in blue, who knew? Blue is a popular color this year. Azarenka looks cute in her blue and white tennis shorts and matching top. The young Canadian phenom Eugenie Bouchard shows athleticism and elegance in her slim-fitting blue dress. Jelena Jankovic is also wearing blue, but she combines it with purple hexagonal spots. 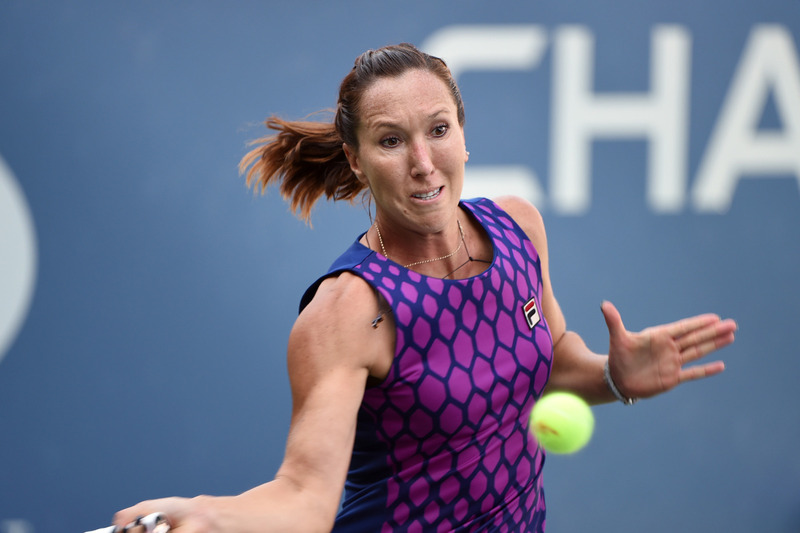 Sponsored by Fila, Jankovic wears a simply styled dress that attracts attention with its bold print. In yet another take on the traditional blue color, Venus Williams is wearing one of her own EleVen designs, in a lady-like white and blue floral with a square opening across the shoulder blades. In her after-match interview, she indicated that this design includes some red — to make it red, white and blue for the US Open. Maybe she’ll add something red for the next round! An often-seen color in early round women’s matches has been blush, or light peach. While blue, black and white are tennis fashion staples, this blush color is fresh and different. One Adidas top in particular has been worn by several players. Who wore it better, in your opinion: Andrea Petkovic, Kimiko Date-Krumm or Maria Kirilenko? 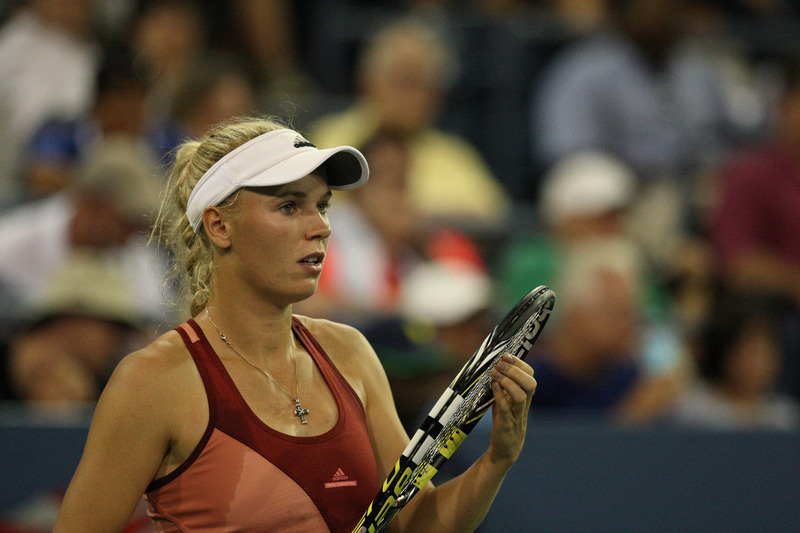 Caroline Wozniacki gets her own version of the Adidas blush. It has a contrasting panel down the front with a kind of flap that comes in two colors, berry and beige. Personally I’m not sure how this “flap” would work on many women’s figures. But on Caroline, of course it looks terrific. The next post will highlight men’s fashions from the US Open Tennis Tournament. Stay tuned! It’s fun to see colorful tennis wear at the staunch All England Lawn Tennis Club. Perhaps not as zany as beach volleyball in the shadow of Buckingham Palace, but a break with tradition all the same. This post will come in two parts. Today I’ll talk about some of the notable women players and what they’re wearing. Note that all these photos are from Zimbio.com, a great source for pictures and news about lots of celebrities, not just tennis players. I like the red, white and blue outfit Nike put together for Serena — a dress works well for her powerful frame. Her sister designed a nice tennis dress for her own EleVen line as well. Check out her matches on TV to see the straps criss-crossing the back of Venus’ outfit. She wins the award for coolest hair accessory! Maria Sharapova looks good, as usual. It was great to see her carrying the flag at the head of Russia’s procession, even if she has lived in the United States since 1994. Her white skirt and red top, part of Nike’s Maria Sharapova Statement Set, are styles we’ve seen before, just in different colors. Caroline Wozniacki sports a cute red dress. It’s longer than her dresses usually are and doesn’t have as much of a “fashion forward” look as her Stella McCartney for Adidas designs usually do — maybe the Danish tennis authorities had to approve her outfit? But check out her nails, mini-flags from her country. Fortunately Victoria Azarenka gets to look at the fuzzy yellow ball when she plays, not at her color combination. It’s not her fault that the colors of Belarus are green and red. Still, watching her on the court reminds me to make this the year I get an early start on my Christmas shopping. Playing in what will likely be her last Olympics, Kim Clijsters looks classically terrific in her red skirt with subtle yellow stripe and white polo embellished with Belgium’s colors. I hope she goes deep in the tournament. Thank goodness the matches are being broadcast on Bravo as well as streamed live. There are so many sports on at once, it’s hard to stay on top of what’s happening with your favorite players — and that’s from the perspective of a spectator! Enjoy the tennis, the fashion and as always, the inevitable drama. Oh, and be sure to send in your opinion on these outfits, or let me know if you see someone else you want to discuss!